Book simply by clicking on the desired workshop – but at least 48 hrs. before start of course. besides a short theoretical introduction into methodology and anatomy as well as the equipment, you will learn to apply the Pilates Principles on selected exercises. You will feel the effects soon. If you want to book a special workshops together with friends (approx. 4-5 people), please contact me for a special appointment. You will find prices on the list below. Coming Workshops. Please click to start booking. Large equipment /2 hours 70€/max. 5 Pers. 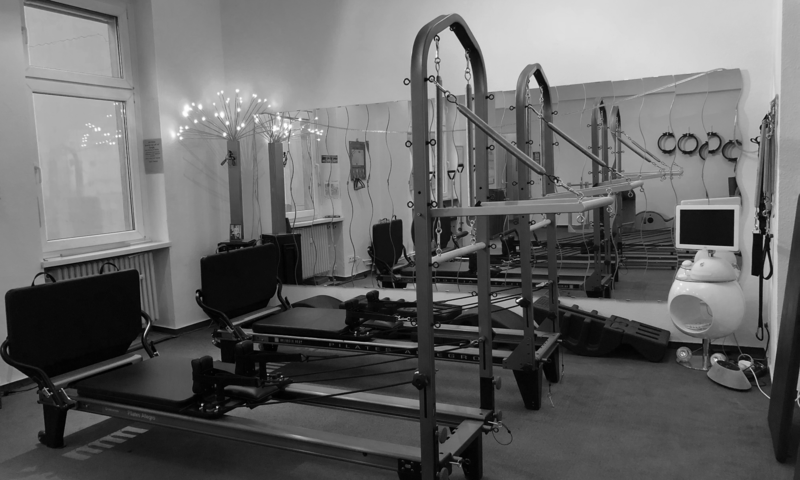 Pilates large equipment: Reformer,Half Trapeze Table,Tower,Barrel,Chair,Spine Corrector (Arc). Every participant will be introduced to the proper initial position and will receive personal backing for a secure practice. This is precise Personal Training with 3-5 participants. Pilates basic knowledge is required. Pilates Small Equipment = Small Props :Magic Circle,Balls,Foam Roller,Rotator Disc,Balance Board, etc.supplemented with Arc and Oov in circle. Pilates basic knowledge is required, it is more difficult than regular training on the mat. Workshops …. prepare for courses, get familiar with the Pilates principles, extend your flow by expanding weekly training, challenge yourself and try something new – like training on large equipment or the Oov – really exciting! Training principles on the equipment are the same than on the mat. Enjoy new dimensions, challenge yourself and improve your agility. “Pilates is harder than it looks”, it will train the deep musculature. Please book at least 48 hours in advance, payments must be received by this time in order to guarantee your slot.